We interrupt our regular blogging schedule to bring you this special report! This news just in: it has been discovered that the stamp collector who has been identified as Albert Decaris Stamps! has just managed to defy the odds and secure, through and stealth and a decent dose of luck, a great bargain. We have managed to secure an exclusive interview with the happy buyer! All jokes aside, this morning when I woke up I got quite the surprise. It all started a little over a week ago when my Decaris catalogue by Bernard Gontier arrived (a review of said book will be coming soon). I noticed in it that Decaris had designed and engraved a 1,000f airmail stamp for Tunisia in 1953. This stamp has a rather hefty SG catalogue value of £47 mint and over double that for genuine used. A glance at eBay and Delcampe yielded rather expensive results. What a shock! But I did spot one item up for bid on eBay that was still on the minimum bid of $0.99. The stamp was not alone it came with the 500f value stamp. Both have some toning, the 500f more so. But I thought that if on the off chance I could get them cheap, the toning could be reduced, if not completely removed by a good peroxide bath. Taking all this into account, I threw on a cheap snipe bid. Pretty certain I'd have no chance. But hey, gotta be in it to win it. Then... Lo and behold I did win it! And for just $2.28 Aust. So I guess now we are at that point where I show you what I got. The images ain't that great, but it gives you an idea of the toning levels. In honesty, the 500f stamp may be a ride-off, but that doesn't bother me. 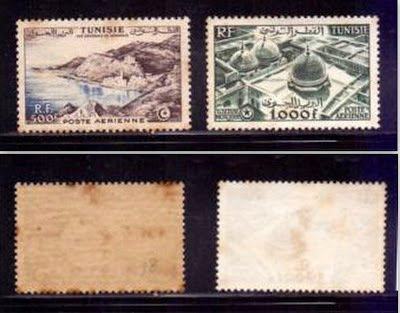 It's the 1,000f on the right that I'm most interested n. As you can see, the toning is considerably less on this stamp. When they arrive I'll give them the peroxide treatment and post up the results! Now back to our regular blogging schedule!